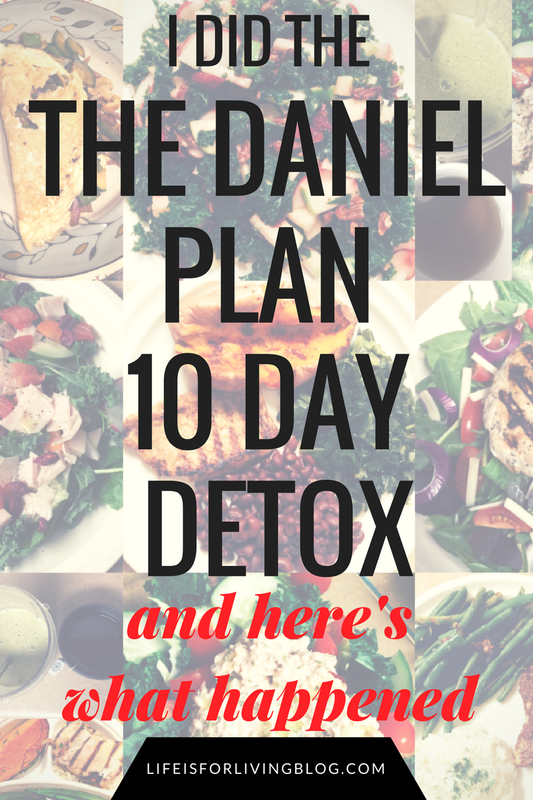 Recently, I announced my latest weight struggle and my determination to get back on track with The Daniel Plan . I was too fired up about weighing back in at 200+ lbs to stall any longer, waiting for January 1 to roll around, so Monday, November 28, was Day One. As I also shared in my previous post, Matt and I decided to do the optional 10-Day Detox to eliminate potential trigger foods that may be causing negative symptoms to identify whether or not we are sensitive to these foods. The Daniel Plan already eliminates sugar and artificial ingredients, but the 10 Day Detox additionally omits caffeine, dairy, and gluten. I've been experiencing a host of symptoms for the last several years (nausea, bloating, heart palpitations, brain fog, anxiety, memory problems, frequent infections, acne) for which no doctor has really found an explanation, so I thought this might be a good opportunity to test myself for gluten/dairy/caffeine intolerance. Like Dr. Hyman says in the book , "If an elephant has been standing on your foot your entire life, you might not notice how painful it is until you remove the elephant." I've never gone without dairy or gluten, and I haven't cut out caffeine in a long time, so I thought, why not give it a try and see what happens? So. The Sunday before the Monday, Matt and I finished up our meal plan for the week, headed to the store, and loaded up on the healthiest cart of groceries we've purchased in ages. I started each day with the same breakfast. Plain herbal tea (not even green tea, because...caffeine) and a protein-and-greens-packed smoothie: Garden of Life chocolate Raw Meal , kale, spinach, frozen banana, organic coconut oil , unsweetened peanut butter powder , turmeric , and either peppermint essential oil (which seriously gives it the flavor of mint chocolate chip ice cream) or cinnamon, nutmeg, and clove, for a spicy, autumny flavor. And of course, to blend it all up, I poured in plain unsweetened almond milk and a little water. For our lunches and dinners, we tried ridiculously healthy recipes that we've never tried before, things we weren't too excited about, that turned out to be pleasantly tasty. Like this kale salad with apples, unsweetened dried cranberries, toasted pecans, and a homemade vinaigrette. Oh, how we dreaded this meal! Especially Matt. Few guys are willing to sit down to a plate of raw kale with fruits and nuts. But it wasn't bad, at all! And how about these flax-meal-coated baked drumsticks from the Daniel Plan Cookbook with sauteed green beans and mashed cauliflower? Nothing sounds much blander than that, right? But OH MY GOODNESS, this was one of our favorite meals! The chicken was impressively juicy on the inside, and crispy on the outside, and a smidgen of fresh dill took those butter-and-milk-free cauli-taters up a few notches! For a snack, to mix things up a bit, I whipped up some baba ganoush dip, one of the Daniel Plan recipes . It's a hummus-like dip made from roasted eggplant. Actually, it was almost exactly like hummus, and it's bean-free, so you know. It's a little nicer on your digestive system. To accompany the baba ganoush, I prepped a giant bowl of chopped veggies for fast and easy, no-excuses access. So. Let's talk about the experience of it all. The first three days, Matt and I both complained of somewhat intense headaches. Obviously, this was due to cutting caffeine cold turkey. We'd gotten into a serious Starbucks habit and would sometimes even have coffee twice a day, and if not coffee, then at least hot tea. Even green tea contains caffeine, so removing even that made an impact on us. However, by the morning of Day 4, we were feeling great, and we've had no headaches since then either. Another Issue: I. Need. Chocolate! 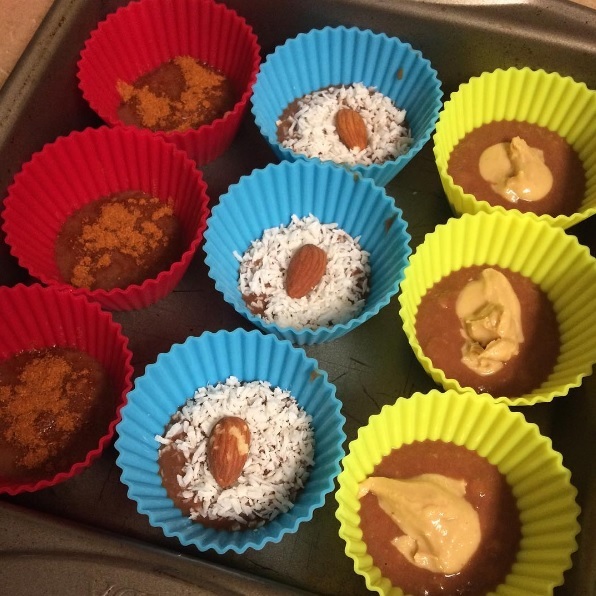 The red cups contain cayenne pepper, the blue are "Almond Joys" with raw almonds and unsweetened coconut flakes, and the yellow is simply unsweetened peanut butter for "Reese's". I scooped more cacao-banana mix on top of that and popped them in the freezer. The final product? They tasted, unfortunately, way too much like bananas (as any paleo banana-containing recipe does, IMO), but they still hit the spot. 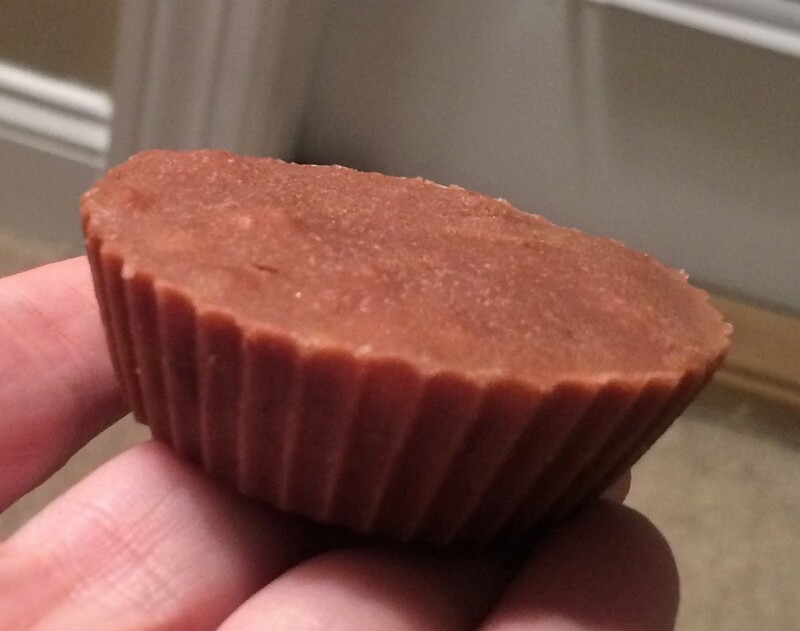 The Reese's ones especially; they were pretty great! It was the perfect way to satisfy my craving without wrecking the plan. When you think of changing your eating habits (or "going on a diet"), you always think about how hungry you're inevitably going to get because there are so many things you can't eat. I mean, when I first considered doing this, I thought But everything has dairy or gluten or caffeine or sugar! What the heck am I going to eat? You just have to plan ahead and get creative. As long as you're eating real food, you can pretty much eat as much of as you want. And guess what? Real food actually fills you up because of its nutritional content. If you eat an apple and a pear, which are both heavy in fiber, you're going to get full. That was probably the biggest surprise for me. A "10 Day Detox" sounds like 10 days of nothing but kale juice until you nearly pass out. But no, we were eating good, filling meals and snacks, and we never really felt deprived (except maybe when it came to coffee). Meal-and-snack-prepping is KEY, but it felt like I spent every free moment I had making food. Seriously, I heard myself griping about it to my husband over and over. All I do any more is prep food! That's just part of it. And arguably, the most essential part. 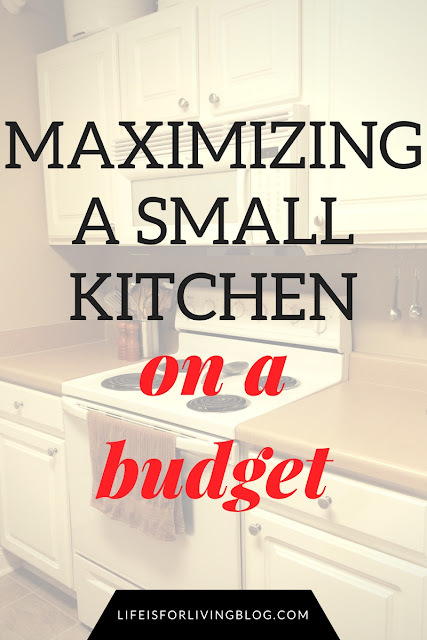 As far as dining out goes, it's probably a good thing (at least for the budget) that you're pretty much limited to your own kitchen. However, it is difficult to deal with family/friends who don't "get" what you're trying to do, and refusing food from them can create problems and hurt feelings. 3. I miss coffee. A lot. 1. I feel soooo much better! Once my caffeine withdrawal headaches wore off, there's no doubt that I felt better. 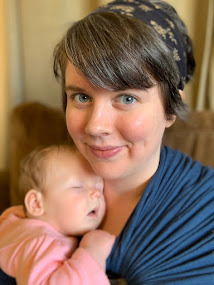 My skin got clearer, my GI system was stable and regular, and I noticed, for the first time in a very long time, that I didn't feel nauseous every day. I actually said it aloud to Matt somewhere around Day 8- "You know, I haven't had any nausea this whole week!" Even when I started work, I didn't get nauseous (we had a pretty sound hypothesis that stress/anxiety was the root of my nausea, but it looks like we were wrong). We'd gotten into a terrible habit of eating dinner on the couch, watching whatever program we were into on Netflix. But from Day 1, we took the book 's advice and tried some things to make our meals more special and more focused on the food we were eating and the people we were eating with (stop and pray before each meal, sit at the dining room table, light candles). This really helped us to slow down, chew, and actually taste our food, which I think also led to a feeling of fullness. Before, we were practically inhaling it as we lost ourselves in the stupid TV. I'd let my private devotional time slide over the last couple of months, when we got busy with packing and moving and stuff. But the Faith aspect of the Plan forced me to redirect my attention to the Lord and commit to spending time in prayer and Bible study. Perhaps the most dramatic result here is in the numbers. I started at 202.4. The morning after Day 10 ended, we weighed in again. Yes!!! I lost a whopping EIGHT POUNDS in 10 days! Matt lost just as much too! Whoop whoop! 5. Finally, I identified that I have issues with both dairy AND gluten! After 10 days without dairy, gluten, caffeine, or sugar, my body was a clean slate, and it was time to begin slowly reintroducing foods. I started with dairy. I had chopped provolone on a salad and plain yogurt as a snack. Maybe this is TMI for you, but in about twenty minutes, my stomach felt weird, within an hour, I had intense abdominal cramps, and about two hours later, I had diarrhea. Multiple times. I ate more cheese the next day and, once again, I had cramps and gas problems. SO. I believe I am going to avoid dairy now. After stopping dairy again, I went back to the Detox food plan and waited about four more days before adding in gluten (the book says to wait three, but I wanted to be extra sure). I made some homemade flour tortillas (just flour, baking soda, olive oil, salt, and water) and made very simple grilled chicken tacos with them. About thirty minutes later, I felt my pulse racing, my chest fluttered uncomfortably, and I felt sweaty and strange. I have experienced this exact same sensation for as far back as I can remember, usually after eating a carb-heavy meal like pasta or pizza. But now I'm thinking, maybe it isn't the carbs that's the problem. Maybe it's the gluten? I don't know. But I think it'd be wise to steer clear of gluten for now. I at least want to save my gluten consumption for something that'll be worth all the adverse effects (and Domino's just won't cut it). I haven't added caffeine yet, and honestly, I'm hesitant to do so. My OBGYN told me that my frequent bladder spasms and UTIs are exacerbated by caffeine, so I'm not quite sure that I want to go back to it now that I've successfully kicked the habit. But I do love lattes dearly and cold brew has my heart, so I might try it occasionally. Sugar is still a no, which is the rule of the regular Daniel Plan , and is very wise for me in my prediabetic state. I will, however, allow the occasional treat sweetened with organic maple syrup, honey, or the like. Anyway, I really want to point out an important lesson that I learned during this process. Aside from short walks to potty Annie, I haven't exercised at all. I lost 8.2 pounds in a ten days from purely nutritional changes. I do plan to increase my physical activity soon, and I am dying to get back into running again, but for now, I'm simply amazed by how powerful food is. I gained weight from the wrong foods, lost weight from the right foods, had tons of physical problems from the wrong foods, and obtained relief from the right ones. I'm continuing to follow the Detox rules, maybe with the exception of occasional caffeine. I'll keep sharing my progress here, so stay tuned! Congrats! I have two friends with Celiac's, and one of them also has tons of other food insensitivities/intolerances. He basically eats Paleo. I did Whole30 last year, but I didn't notice anything with my reintroduction phase. Which didn't surprise me, because I was gluten-free and dairy-free as a teenager, and nothing happened when I reintroduced those into my diet. I just have weird dairy issues--I can eat dairy fats like cheese, but plain milk/ice cream/milk shakes/chocolate make me sick. I feel sick within about 5 minutes of having just a sip of milk, and I spend about 24 hours in turmoil. Thank you so much for this article!! Very well written and it helps a lot to know what to expect when embarking on this "health-style". Congratulations on your success! Blessings! Congratulations on the weight loss. Detoxing is a way to help figure out what causes your body to react the way it does. I have been on this journey since the beginning of the year and I have learned I am caffeine sensitive so if I want a cup of coffee then I drink it decaffeinated and with coconut cream, dairy makes my joints and eyes hurt do to it high inflammatory response. Hi, congrats on your refocus and weight loss. I am now starting The Daniel Diet as well. The information I have read doesn’t include a lot of what you used in your diet. Were you doing the fast? Or just detox? Thanks. I thought the whole point of the Daniel fast was that it has no animal products at all. This is NOT the Daniel fast? Congrats on feeing better and weight loss! Sanjay Precision Industries are one the main producer and provider of the cylinder and cylinder brambles/cast press cylinder hedges. These cylinder bushed are fabricated with great cast press which has certain rates of carbon, chromium, nickel and molybdenum. Our cylinder and cylinder shrubberies are broadly utilized as imperative extra parts of various motors as a result of their great cast capacity like warmth opposition, protection from surface scraped area, high warm conductivity and low warm development.